If you were to rank the pages of your website by importance to your clients, your first instinct might be to put your more personal pages--like your About Us and Staff pages--somewhere near the bottom of the list. Potential clients typically seek out a company’s webpage to find out three things: the first, information on the services it offers. The second thing that an interested prospect will review are any educational resources in the company blogs and newsletters to assure themselves that yes, this company knows what it is talking about. The third thing that drives someone to visit a website is a desire to gain a deeper insight into the company’s “personality” so they may judge whether or not it’s a company they feel they can do business with. While many companies are aware that they need to supply their website’s visitors with quality information about their services and demonstrations of their knowledgeability, many still underestimate the value of a well-composed About Us section. After all, besides creating the content, what do the people who work at a company have to do with that company’s content marketing? Well, if you listen to expert advice on the subject, quite a bit. As Joe Pulizzi, founder of the Content Marketing Institute, puts it, “Content marketing is all about telling a compelling story.” Which means that you need to include a few essential elements to any story: the setting and characters. It is extraordinarily rare for someone not to be (at the very least) a little interested in your company’s philosophy and history. In fact, 52% of business-to-business decision makers immediately look for any “About Us” information when they visit a website. Those potential clients who view it also convert at a rate 30% higher than those who don’t. In a way, this boost to lead conversion makes sense--not many people relish the thought of dealing with a company that presents itself as a single, unfeeling unit. However, if a company tells its story as a narrative, with backstory in its history, leadership demonstrated in its characters, and triumphs displayed by awards and accolades, a visiting prospect can become invested in the human side of the company. What’s more, this narrative not only makes the values embodied by the company very clear, but can show why the company holds the values that it does. Of course, your site should also explain who your services are meant for and why your services in particular are the best choice for fulfilling their needs--but this can all be a part of your narrative as well. If a story needs one thing to be considered a compelling narrative, that thing would be an ensemble of characters that drive the action forward. This is where the employees on your Staff page come in. 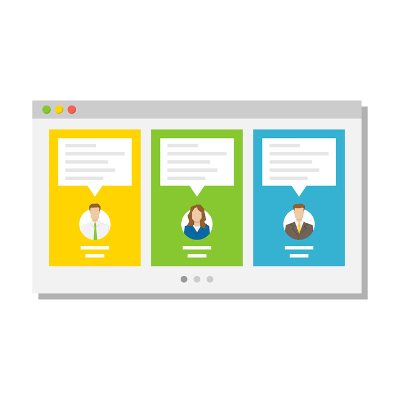 In addition to giving assorted human faces to your company, your Staff page can provide your clients with a clear view of the personalities that support it. Rather than filling these pages with dry collections of keywords that are clearly intended to pitch a sale, show who your employees are as people, with goals and dreams for their personal and professional futures. Otherwise, what should be the most approachable page on your site will drive visitors away with a sour taste in their mouths. Be honest as you tell the emotional story behind your company, instead of composing a sterilized office memo. Of course, as with any marketing process, putting together effective company culture pages has its own set of best practices to follow. Use visual aids - As some of the most personally engaging pages on the site, your company culture pages should have more than just line after line of text. Producing your own photo and video content to include on the page gives your visitors an inside look at your environment. Of course, to successfully create an honest impression of your company you should not use stock photos to represent you and your employees, as this defeats the purpose of the page: representing you and your company. Include company history - Returning to what was mentioned above about developing a narrative for your company to follow, many clients would be interested in hearing about where you have been in addition to where you are now. Giving details like your location, your company vision, when you began operations and other company information like that in a literary format will allow your copy to flow as a story, more than a list of facts, dates, and figures would. Engage your visitors - Since these pages are most likely where your prospects would be most willing to reach out and connect with you, make sure you give them plenty of opportunity to do so. Including forms for visitors to contact you, sign up for events, or links to social media will encourage them to increase their interactions with you when they are most inclined to do so, allowing you to more easily make impressions on them. When in doubt, consult a professional - Just as with any sort of writing, creating an engaging company culture website section is a practiced skill. If your attempts aren’t quite hitting the tone you want them to, there is always the option to enlist someone with experience compiling and composing compelling copy for exactly these purposes. So there you have it; why company culture pages are critical for your website’s optimal level of success, and how to best create them. For more assistance in putting together this excellent marketing tool, or any of your other initiatives, don’t hesitate to reach out us.